Visual Composer allows you to create custom post lists and display them on your site. This can be considered as an alternative to WordPress category pages with the exception that you can fully customize the page and apply various variables to your post output. Moreover, you can display in a list not only posts, but also pages, and custom post types. Do I really need custom post grid? Your WordPress theme is more or less strict in terms of post display which means you have limited options to change it without code. At the same time, your website design or type of the content may require a completely different post or custom post type output. For example, you want to display your portfolio in a grid, not in a list format. And this is exactly where post grid elements can help you out. Visual Composer offers several post grid elements that can be downloaded from the Hub with the Premium license activated. Post grid elements are no different from any other elements of the Visual Composer in a way that they can be simply added to your layout. The core difference is the options that are available within Post Grid elements. 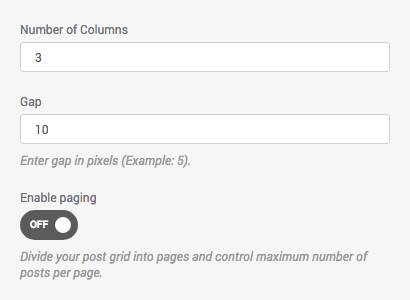 In different post grid elements, you will find various attributes to control gaps, columns and visual aspects of your grid. Of course, the true power of the post grid elements is the option to control what type of data should be taken and ability to adjust it. A common section of attributes for all post grid elements is Data Source. This is the place where you control which type of content should be displayed in your post grid and/or apply restrictions. 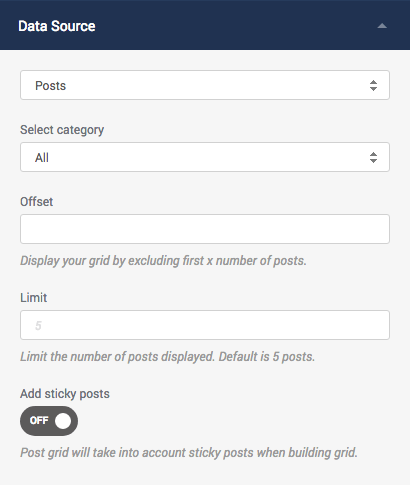 Add sticky posts: this option allows you to include or exclude WordPress sticky posts in your grid.